This posture is one of a set of four that I seem to remember reading in a Yoga magazine many years ago. 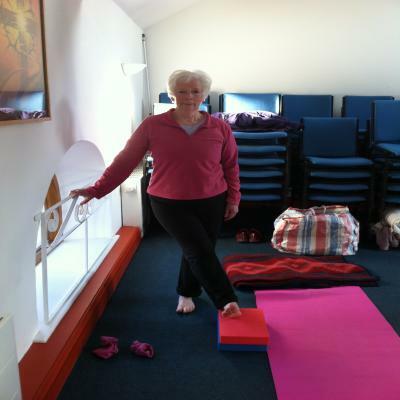 The article was of a BKS Iyengar Master Class. This is the posture I personally found and still find hardest out of the four. Now I know that I do have problems with my lower back, too much sitting at computers and too much driving, too much running and not enough yoga practise. I should have worked hard on this posture. It is so easy to be wise in retrospect! If you are a runner, especially if you are female, you may find that the increased size of your quad muscles, tightens your hamstrings and they then pull on your "sitting bones". It can become uncomfortable to sit down. This is one of the postures that will help you release some of the tension from the lower back. You also need to practise Uttasana and to stretch out your quads but I'll discuss these in options. Place the chair beside you, in theory so that as you are facing forwards, the chair is beside your hip at right angles to the front of your body. In my case, I have to place the chair in front of me and slightly to the side of me. If you are worried about your balance you can always borrow a friend. In this photo, the student had just felt sufficiently confident to let go of her friend's hand. You'll notice that her foot on the floor is facing forwards which is good. Her trunk is drifting towards the chair which is human but not so good and her foot on the chair ought to be pointing upwards heavenwards. That for most of us is the hardest part. 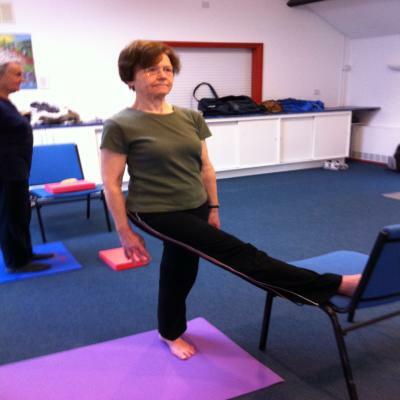 This student finds many asanas very easy but found she had to settle for quite a small movement of the leg across her trunk. She moved her chair forward to make it easier for her. I do that too! If you look, her foot on the floor is straight. Her chest is open which is good. Her trunk is extended upwards which is good, her hips are facing forward which is good. 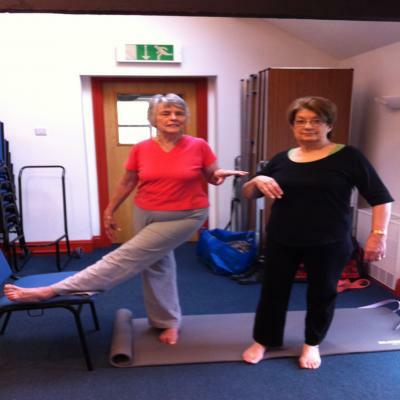 If you have had a hip replacement, this is not a posture to practise unless your doctor has said you can. If you find that using a chair is impossible, do not be afraid to start off with a raised block or a book in place of a chair and gradually work up to a greater height and/or greater movement to the side of your leg.